Can One Simple Nutritional Change Make You More Productive? Science says it may come down to managing blood sugar. If you’re used to the rush provided by that first cup of coffee in the morning, or you’ve come back from lunch feeling energized and refreshed or you just can’t focus on anything because your stomach is growling, it won’t surprise you to learn that there’s a link between productivity and nutrition, with unhealthy eaters 66 percent more likely to report productivity loss. What you eat, and how and when you eat it, has an impact on how well you perform during the day — and your long-term habits will have a substantial impact on your health. The problem is, nutrition is complicated. Due to constantly emerging changes in the field of nutritional science, it’s hard to keep up with the most recent recommendations, as described in this New York Times piece. Due to the complexity of our bodies, nutrition is inherently difficult to understand; you need to consider caloric intake, macronutritional balances (like carbs, fats and proteins), and micronutritional balances (like vitamins and minerals). And the proposed solutions that offer simplified suggestions often turn into fad diets, which Pennington Biomedical Research Center demonstrates are almost always ineffective at improving health and managing weight long term. That being said, there may be a simple nutritional trick to help you become more productive at work, and it’s all about your blood sugar levels. A well-fueled brain is an attentive, efficient and hardy brain. Everything in our body relies on energy to work — and that includes our brain, which for most people is the center of productivity. A well-fueled brain is an attentive, efficient and hardy brain — one that can do more tasks per hour and feel less strain from the effort. Energy in our body is supplied via the blood stream in the form of glucose, which is the stripped-down version of the energy we eat in food. Accordingly, when your blood sugar is high enough to supply plentiful energy, you’re going to perform your best. This isn’t mere speculation — research shows that productivity peaks with about 25 grams of glucose in the bloodstream. Any less than that, and your effectiveness starts to taper off — so don’t jump into work on an empty stomach. To get to that level, you could eat a bowl of oatmeal or a donut. Both are capable of raising your blood sugar sufficiently. But here’s where the difference is significant, and why your intuitive guess that the oatmeal is a better choice is correct: donuts are full of simple sugars, which are easily broken down and released by the body, while oatmeal is full of complex carbs, which take time to be broken down. The result is a sharp spike in blood sugar from the donut, which soon crashes and leaves your blood sugar as low as it was before. 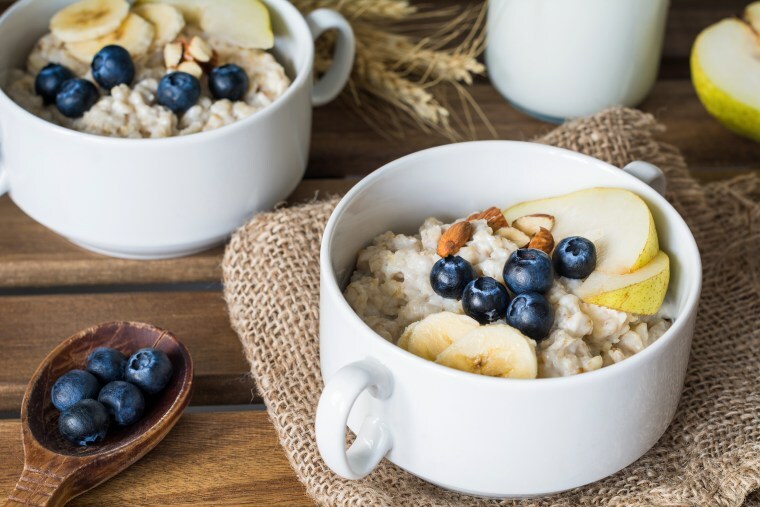 Oatmeal, on the other hand, results in a gradual release, which keeps your blood sugar steady for several hours. To try and simplify the complexities of nutrition, this means one of your greatest nutritional goals is blood sugar management. Your goal should be to keep your blood sugar at an optimal level as well as consistent throughout the course of your day by selecting foods that release glucose slowly, rather than quickly, and grazing on them throughout the workday. This one change could dramatically boost your productivity. Fortunately, there’s an easy system to help you figure out which food items are appropriate, known as the glycemic index, which tells you how quickly or slowly a food releases glucose to the bloodstream. Low GI foods include oatmeal, whole grains, and vegetables, while high GI foods include candy, pasta and most types of fruit. You might be surprised to find out which foods belong to each category. It’s important to remember that blood sugar isn’t the only nutritional factor affecting your productivity, and it may not even be the biggest factor (especially when you factor in the effects of long-term habits). For example, certain micronutrients like omega-3 fatty acids and vitamin E are shown to improve brain health over time, and any “healthy” diet is going to improve your feelings of wellness, making your more energetic and confident in your work. Nutrition and productivity have a complicated relationship, so while no single change is likely to dramatically improve your productivity, the transition to a gradual, low-glycemic index diet throughout the workday can make you more alert, less distracted and more productive overall. Keep low-GI snacks around your desk so you can graze throughout the day, don’t leave the house without eating breakfast and try to stay away from sugary snacks or enormous lunches, which can cause your blood sugar to spike and crash later. Anna is a freelance writer, researcher, and business consultant. Follow her on Twitter.